a Junior Suite, a copious buffet breakfast and a delicious 5-course dinner at Champlain Restaurant. Charming and comfortable, Junior Suites are popular with families and long stay guests. They are composed of a bedroom with one bathroom, a sofa and a living room / sitting area separated from the bedroom by a wall, a hall or a door. 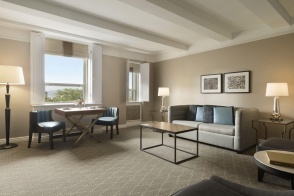 Junior Suites are ideal for guests that would like to entertain as this room category offers sitting space for approximately five people in the living room.